Barbados is the place with some of the most beautiful beaches in the world. The white sand, the turquoise water, and the endless possibilities for fun make this location appealing for many tourists around the world. Since it is located in the Caribbean, you cannot fail in having a wonderful trip there. The climate is perfect for sunbathing, the beaches provide the sun and relaxation you need to recharge your batteries, and exploring the island can be fascinating. Before booking a flight to Barbados, you may be wondering whether or not you need a visa to enter the island. The answer depends on your nationality. According to the visa policy of Barbados, there are many visa-exempt countries whose nationals need only their passport to take a trip there. The period of time they can spend there, however, differs. For example, an Australian citizen can remain 6 months in Barbados without a visa, while a Ukrainian traveler is allowed only 28 days. You can check where you stand quite easily. We have developed the Visa Checker, a tool in which you insert your nationality and select Barbados as your destination. The result will be displayed in just a second, and it will tell you if you need a visa for Barbados or not. If you do not, then you can book a flight and be on your way. If not, we provide a list of the nearest embassies where you can go and submit an application. At the moment, we do not process Barbados visa applications. However, we still want to help you in finding out the information you need. If you do require a visa to access Barbados, you can go to the nearest embassy. Furthermore, if your country of origin does not have a Barbadian diplomatic post, you can go to the nearest British consulate and apply there. Barbados was, after all a British colony, and relations have been well kept. As for the requirements you need to meet to get your visa for Barbados, in case you are not from a visa-exempt country, the best course of action would be for you to call the diplomatic mission you are applying at and ask all the questions you may have. The internet can help you a great deal, but you should use that information for reference only. A consulate/embassy is the best source of reliable information. What we can tell you is that you need a valid passport, but it needs to remain valid for at least another 6 months from the date of arrival in Barbados. Also, a visa application requires you that you have two passport-sized photographs. Even if we cannot help you with the Barbados visa application process, we hope that the information provided above is of some help. 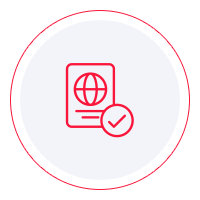 In the meantime, we process thousands of other visa applications, and if you need our assistance, we are more than happy to help. Moreover, we have a support service that is available 24/7 in case you have other questions. Our consultants are ready to take your call and help you to the best of their abilities.